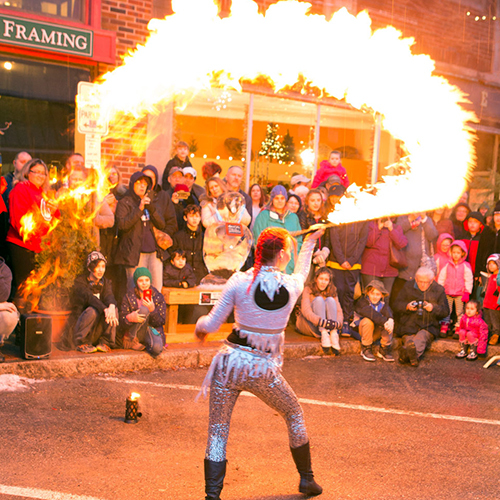 Fire Gypsy is a fire performer who provides incredible, mind blowing, and versatile fire performances in Massachusetts, Connecticut, Rhode Island, New Hampshire, Maine, Vermont, and New York. 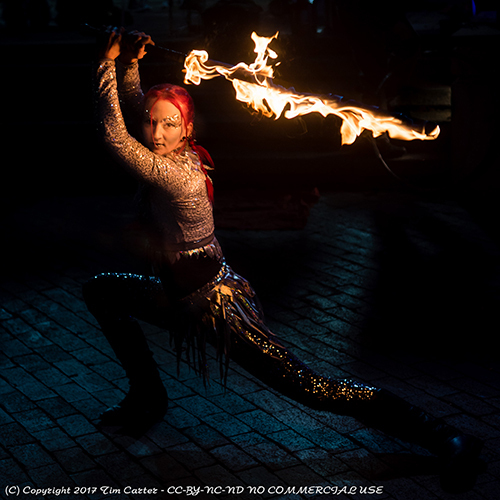 Sasha the Fire Gypsy is available to perform anywhere in the USA or internationally. 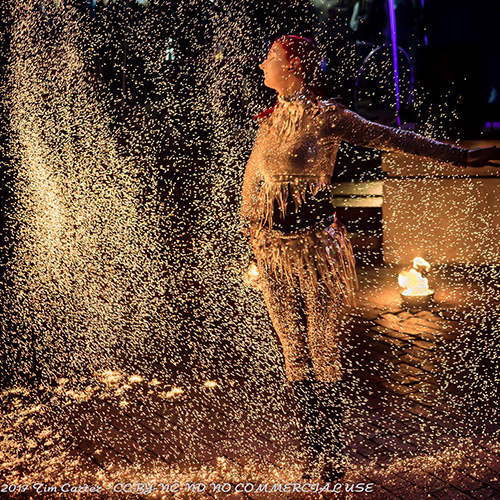 Each fire performance is customized to your event, budget, and vision. 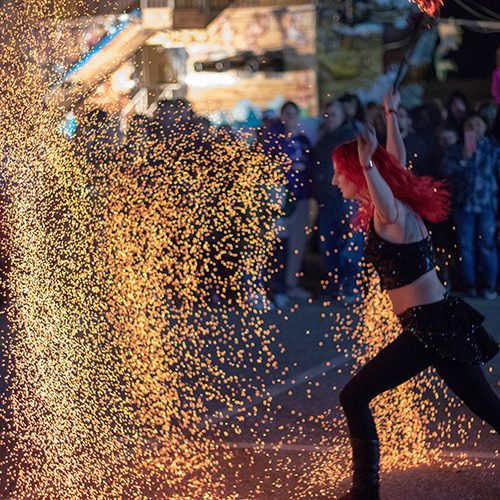 The fire show is designed to build in speed, difficulty, and excitement while combining choreography, theatrics, drama, contortion, acrobatics, and dance to bring fire performance to the highest level of amazement and professionalism! The show is performed in costume and choreographed to music. 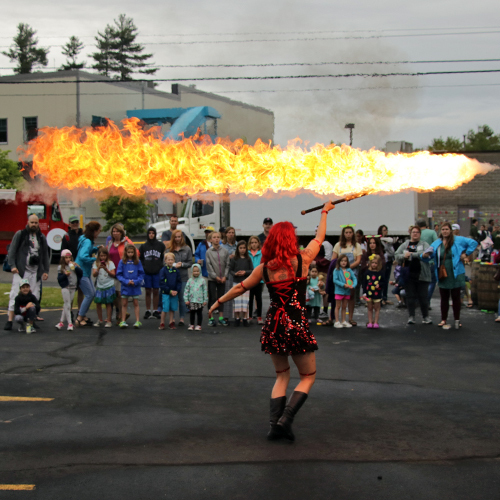 With 12 years of professional performance experience and hundreds of fire shows performed for hundreds of clients and thousands upon thousands of spectators, you can be sure that you are hiring a professional fire performer to put on an incredible, mind blowing show that is 100% safe! Sasha is known for her choreographed performances that include dance, theatrics, acrobatics, interaction, and skill. She is rarely occupying one spot in the performance space for long and loves to utilize the whole performance area while giving individual attention to spectators throughout the show. 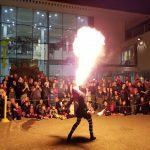 As a multi-disciplinary fire artist, she is one of the few performers who can perform an hour long solo show without repeating acts. 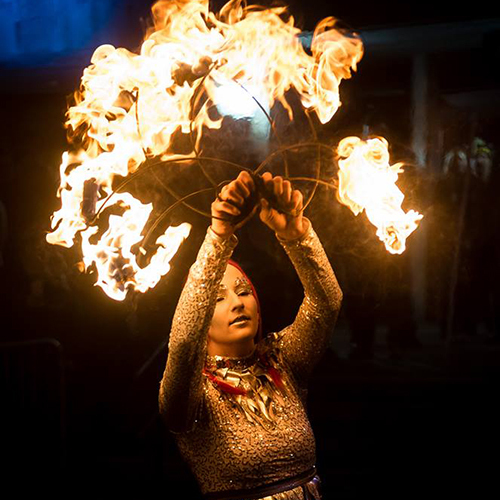 Your guests will watch in amazement as Sasha puts fiery torches out with her mouth, dances with a blazing hula hoop in ways you never imagined, and executes mind melting backbends while spinning balls of fire just inches away from her face! You will FEEL the heat when Sasha breathes huge, towering plumes of fire! Sasha has many costume styles and colors to choose from to fit your theme, and modesty level. You can even select a music style that best fits your event, or requests specific songs for her to choreograph acts to. Sasha follows the highest safety standards for performing with fire. Fire performance should look dangerous, not be dangerous. She carries liability insurance, has the FDNY E-29 Fire Performer certificate of fitness, hold a Certificate of Education in Fire Safety for the Flow Arts from the Flow Arts Institute, and is always accompanied by a trained Fire Safety Technician. Sasha is also well versed in permitting procedures and can help you find out if a permit is needed for your event and file the paperwork. 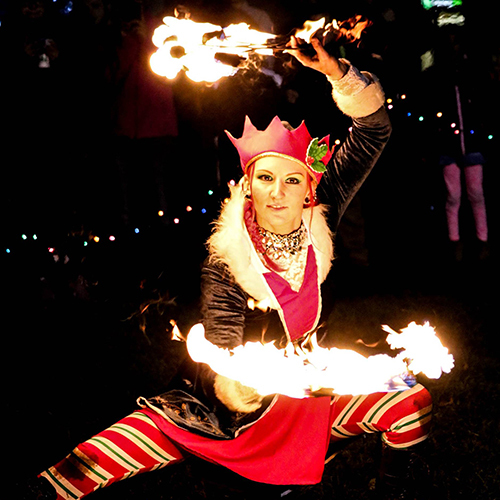 Fire Shows can be performed inside or outside. Inside shows are subject to your local fire regulations. 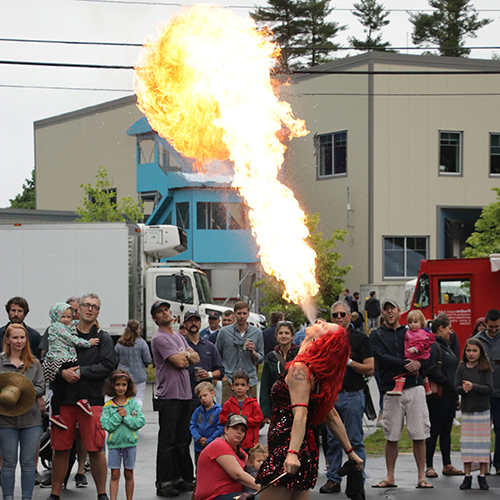 Fire Eating is a slow, graceful, and controlled act. 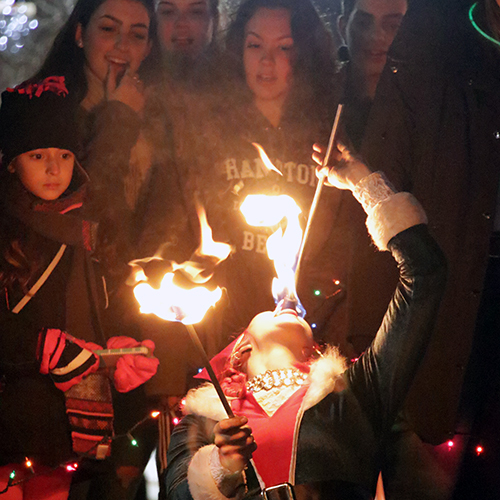 Sasha performs various fire eating skills such as vapor holds, teeth holds, tongue transfers, skin transfers, and fleshing. Sasha is able to get up close and personal with this act, giving you an incredibly close view. 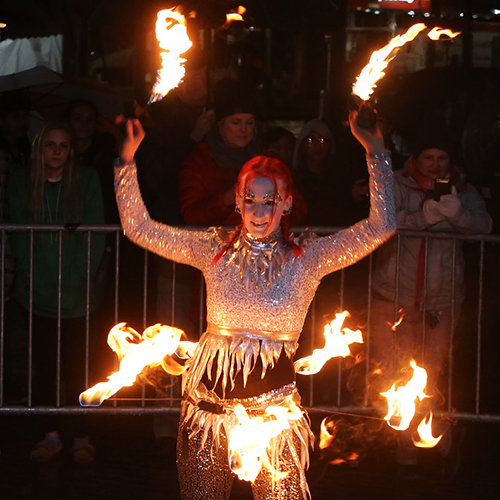 You'll be amazed as she lights parts of her own body on FIRE! 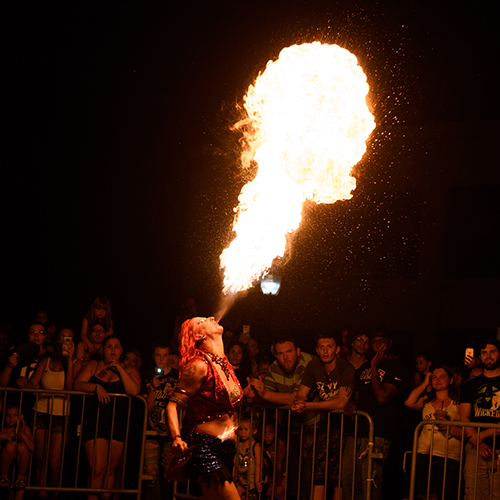 Stand back and get ready to feel the heat as Sasha breathes giant towering plumes of fire out of her mouth! 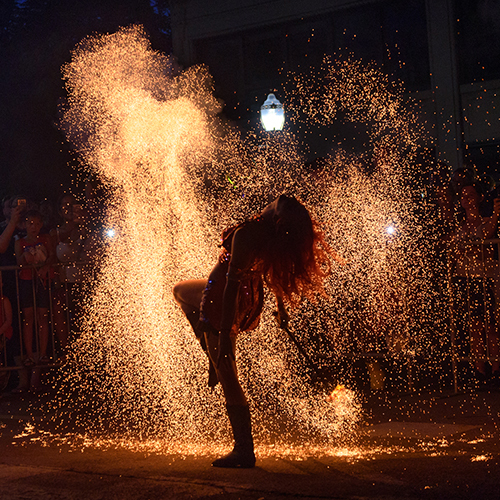 This thrilling and high energy act will amaze you as she times the fire breaths with the intense beats of the music. As the most dangerous of all the acts, this one will leave you breathless! This belt with attached wicked spokes is strapped to Sasha's waist, accentuating each movement of her hips with fire. It is paired with palm torches, which are held in each hand. This act features tribal fusion belly dance and lots of variable speed movements and dance. Two fans....on FIRE! These fire fans contain a LOT of flame! The fire fans are held in each hand and allow Sasha to move herself and the fans with precision to the transitions and pauses in the music, while also including full movement dance and fabulous fan spins! Yes, a hula hoop, on FIRE! You will be amazed as you watch Sasha execute incredible moves you never thought were possible with what you previously perceived to be a "kids toy". Watch her dance with this ring of fire, performing on and off the body moves to beat of the music. 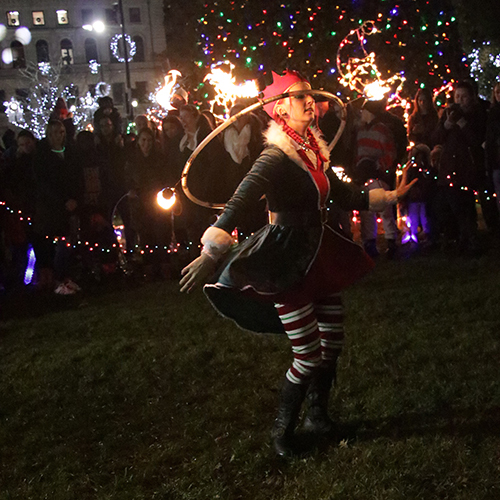 Fire poi is definitely a crowd favorite! 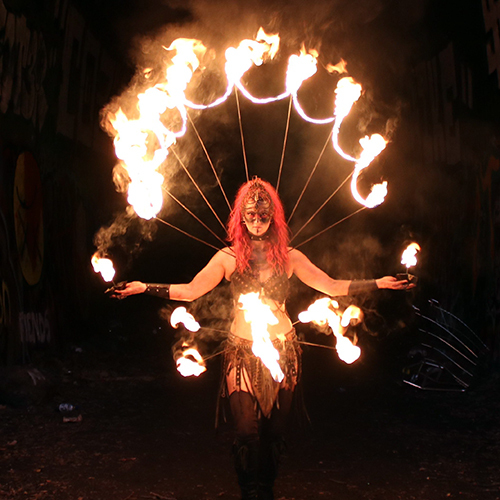 These two balls of fire on chains are spun with precision only inches from Sasha's body, face, and hair. Watch as Sasha spins these fireballs to the beat of the music. This is a much faster, more extreme act that will leave you in awe! This visually stunning and unique act is a definite crowd pleaser! Starting with the Scepter on fire, the audience doesn't know what lies ahead. As the fire dims down during Sasha's introductory dance and the embers begin to flow, the crowd knows that this is something unlike they have ever seen. Faster, she dances and spins, getting the coals white hot as they start to emerge from their cage. And suddenly, BAM, she darts the Scepter creating incredible amounts of embers floating through the air! Watch as she walks through a wall of fluttering embers in the air and continues to dance with grace and danger. Not only are these rope version of Poi on fire and being spun at high speeds with BIG flames, but they are treated with a special additive that makes them SPARKLE! This extreme act is performed at high speed and is usually part of the finale. The audience goes WILD for this act! This unique and intense act will catch you by surprise! Starting slow and mysterious, you won't know what on earth happened as the music picks up and Sasha wields this sword with grace and precision to the music and creates beautiful trails of fire. You will be mesmerized by the quick spinning of this fiery twist on the traditional martial arts bo-staff. 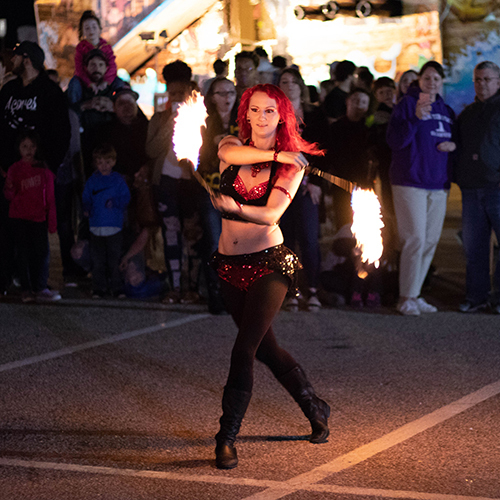 During this act, you'll watch as Sasha performs some vision blurring fast spins, one handed tosses, back-bending palm spins, and so much more with her 6 foot long fire staff or two short fire staves! This wearable contraption is a truly one-of-a-kind design. It can be paired with the hip belt and palm torches, or with the grinder act. Or it can be worn solo for a theatrical styled performance. Sasha can also create custom fire lettering in the center of this piece. 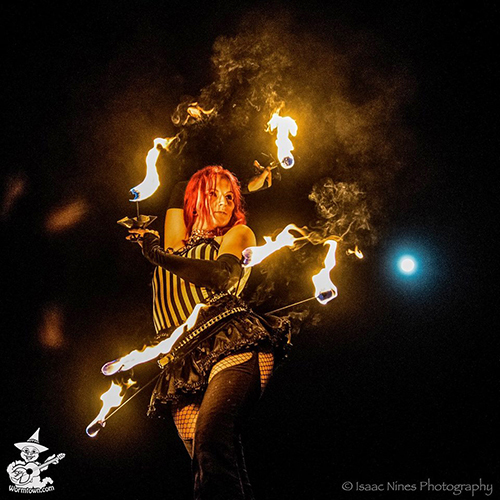 With over 13 different fire acts, Sasha is one of the few fire performers who has enough acts to perform up to a 60 minute non-stop solo show without repeating anything. Fire shows range from 10 minutes to 60 minutes long. The longer the show, the more acts can be performed. 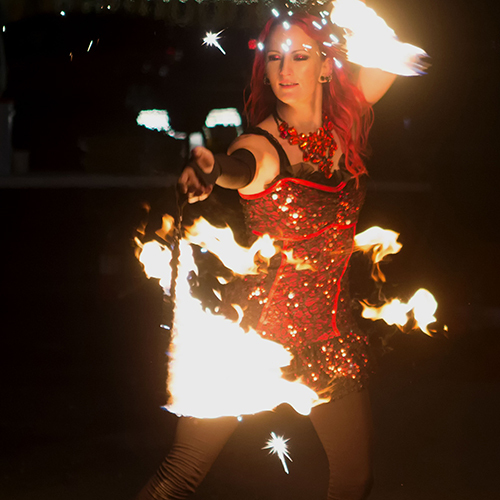 Sasha also works with other amazing fire performers for even bigger, longer, and more extravagant shows! 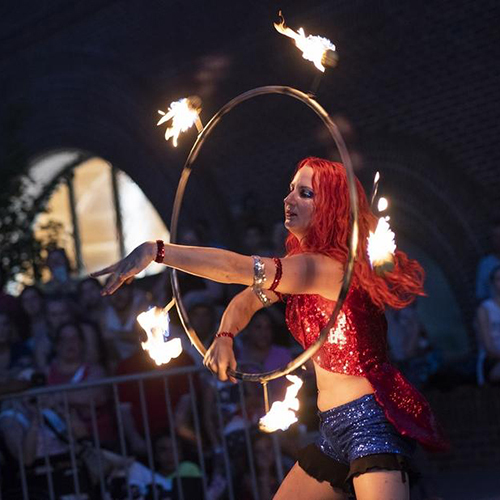 Here are a few standard fire show options to choose from. You can mix and match any props into the shows, or create your own length. Available acts include: Fire Eating, Fire Hip Belt with Palm Torches, Fire Fans, Fire Hula Hoop, Fire Staff, Fire Double Staves, Fire Poi, Fire Whip, Fire Breathing, Fire Sparkle Ropes, Charcoal Scepter, Fire Collar, Fire Headdress, Fire Fingers, Fire Rope Dart, Fire Walls (atmospheric element added to the show). The performance time is an estimate relative to the average burn time of all the included props combined. 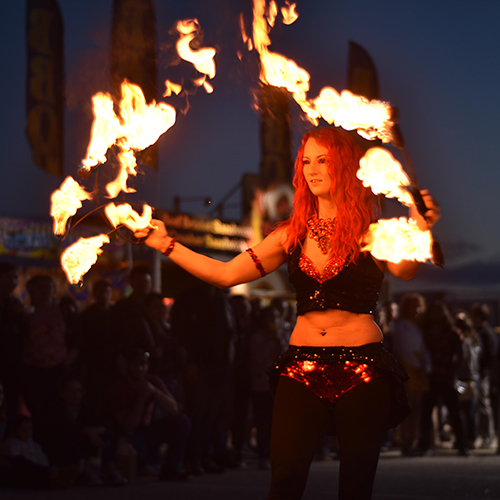 Option 1: Fire Eating, Hip Belt with Palm Torches, and Fans. Option 2: Fire Eating, Hula Hoop, and Poi. Option 3: Fire Eating, Fans, and Poi. Option 4: Fire Eating, Fans, and Hula Hoop. Option 5: Fire Eating, Poi, Sparkle Ropes and Fire Breathing. And so on. Any three acts. Ropes and Breathing is one act together. 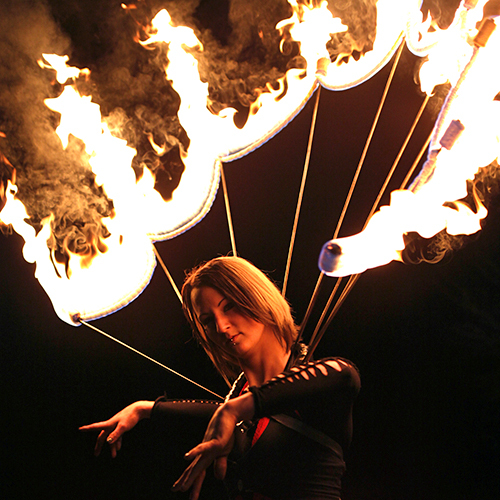 Option 1: Fire Eating, Hip Belt with Palm Torches, Fans, and Poi. Option 2: Fire Eating, Hip Belt with Palm Torches, Hula Hoop, and Poi. Option 3: Fire Eating, Fans, Hula Hoop, and Poi. 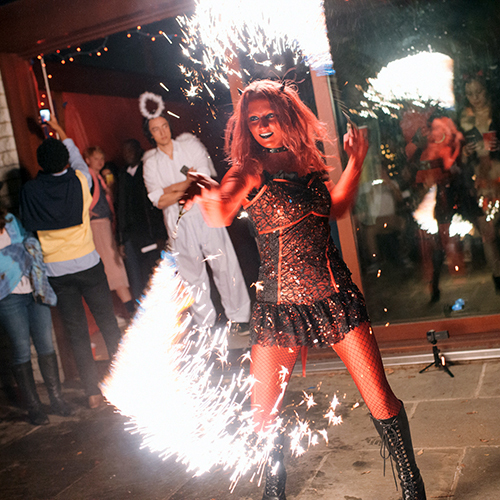 Option 4: Fire Eating, Hula Hoop, Poi, Sparkle Ropes and Fire Breathing. And so on. Any four acts. Ropes and Breathing is one act together. 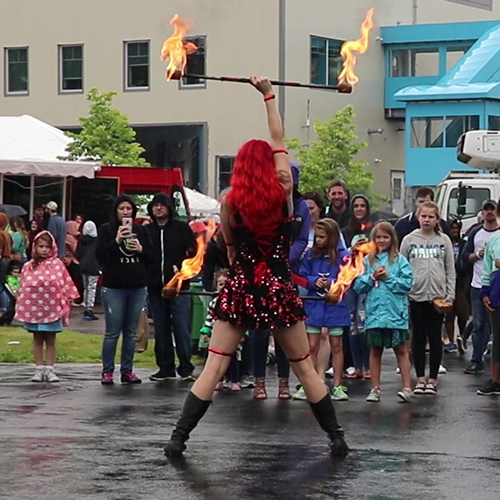 Fire Eating, Fans, Hula Hoop, Poi, Charcoal Scepter, and a big finale of Fire Breathing and Ropes with a special additive that makes them sparkle! You could choose one, 20 minute show, or two 10 minute sets. 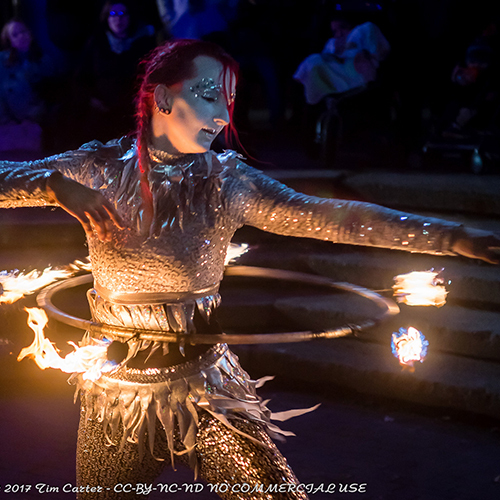 Fire Eating, Hip Belt with Palm Torches, Flamethrower Sword, Fans, Staff, Hula Hoop, Poi, Charcoal Scepter, and a big finale of Fire Breathing and Ropes with a special additive that makes them sparkle! This show is a full-length production. Fire Eating, Fine Fingers, Hip Belt with Palm Torches, Double Staves, Flamethrower Sword, Fans, Staff, Hula Hoop, Poi, Fire Whip, Charcoal Scepter, Fire Collar with Angle Grinder, and a big finale of Fire Breathing and Ropes with a special additive that makes them sparkle! 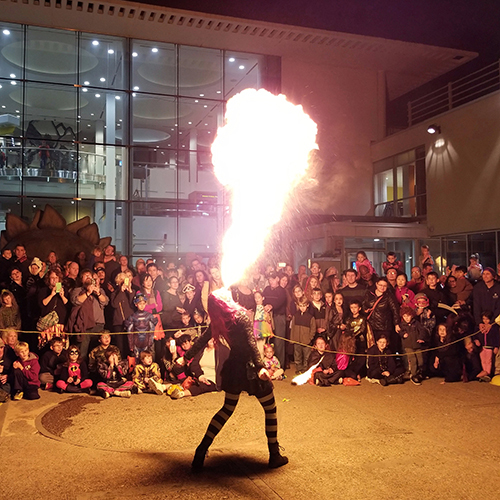 Fire Eating, Hip Belt with Palm Torches, Contact Staff, Double Staves, Flamethrower Sword, Fire Breathing, Fans, Poi, Dragon Staff, Hula Hoop, Angle Grinder, Sparkle Ropes and Fire Breathing. This is great for events that want performances throughout the night with audiences that are constantly changing. 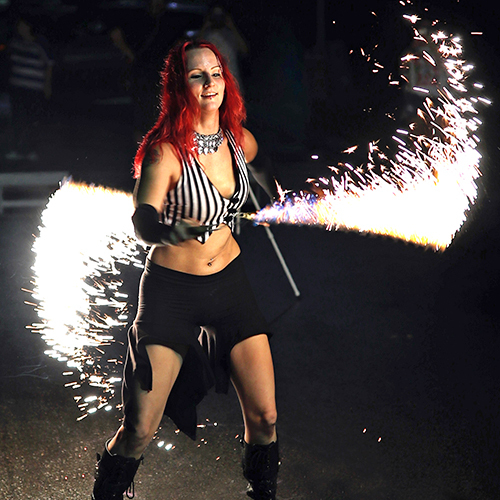 Each set begins with Fire Eating to grab attention and rope people in. Option 1: 5 minute performances every 10 minute for a total of 4 per hour. 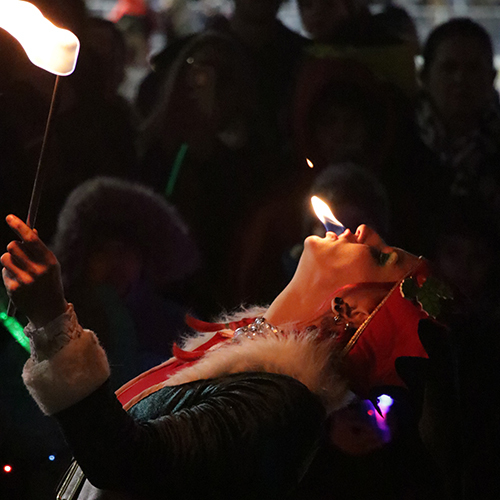 Each two act set will begin with Fire Eating and switch out the second act so that the shows are always different. Option 2: 10 minute performances every 15 minute for a total of 3 per hour. 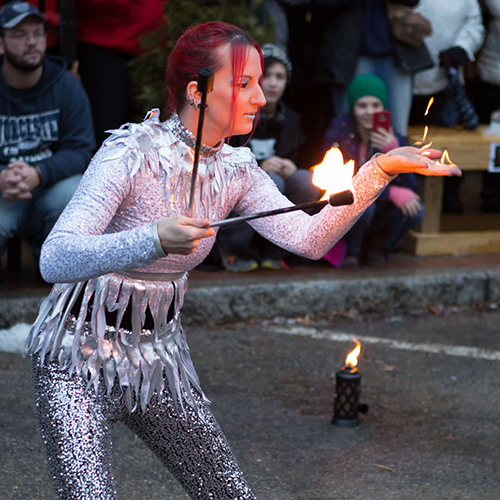 Each three act set will begin with Fire Eating and switch out two acts in rotation so that the shows are always different. Option 3: 15 minute performances every 15 minutes for a total of 2 per hour. Each four act set will begin with Fire Eating and switch out two acts in rotation so that the shows are always different.